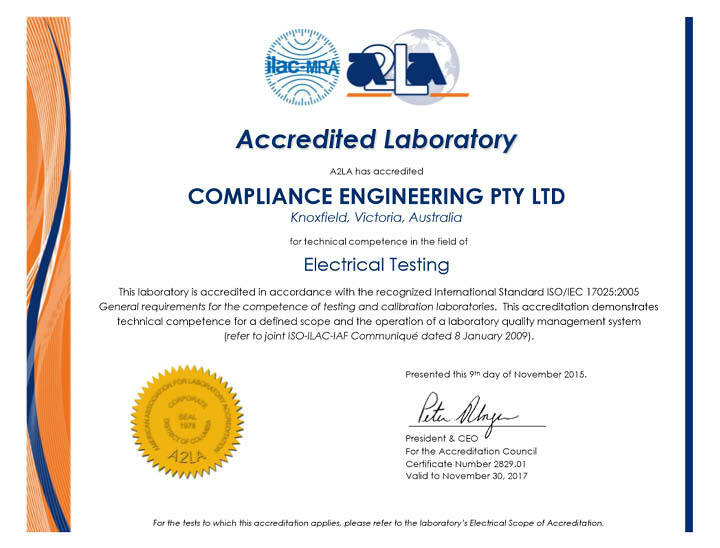 To demonstrate our commitment to quality and technical competence, Compliance Engineering pursued and obtained accreditation from the American Association for Laboratory Accreditation (A2LA), which is one of the world’s most highly respected accreditation organisations. A2LA is a signatory to several bilateral and multilateral mutual recognition arrangements (MRA’s) including the International Laboratory Accreditation Cooperation (ILAC), the Asia Pacific Laboratory Accreditation Cooperation (APLAC), and the InterAmerican Accreditation Cooperation (IAAC). These agreements facilitate the acceptance of test reports between A2LA-accredited laboratories and 46 economies around the globe. In addition, A2LA has recognition from over 30 federal, state and local government agencies, companies and associations. A2LA and NATA (National Association of Testing Authorities) are both signatories to the ILAC MRA and acceptance testing and calibration results from each organisation are mutually recognised.